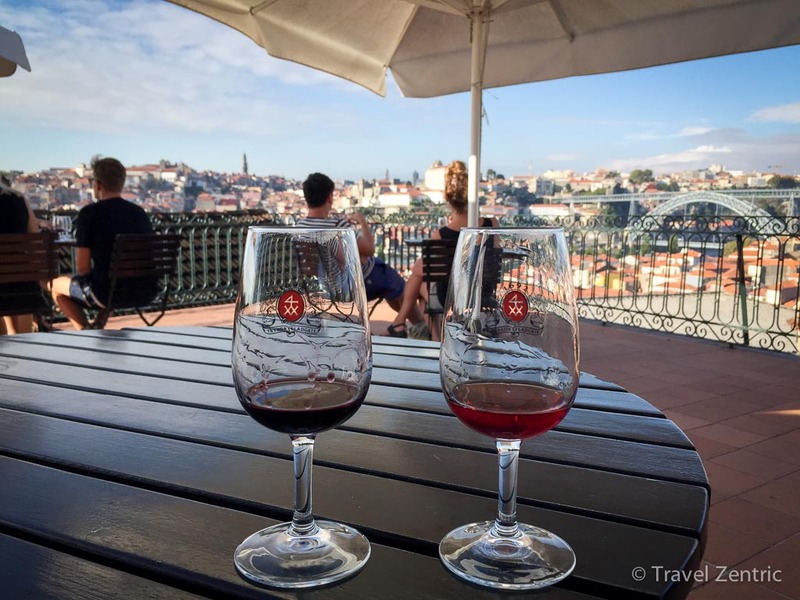 Are you wondering where to go in Portugal and what the best places are to spend a self-organized vacation? 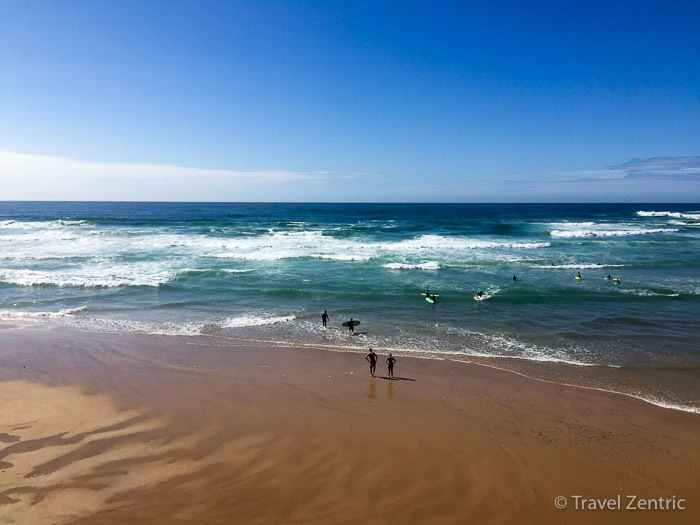 After some time in Porto and Lisbon, I wanted to get out of the city, relax, enjoy time at the beach and in the Alentejo region. 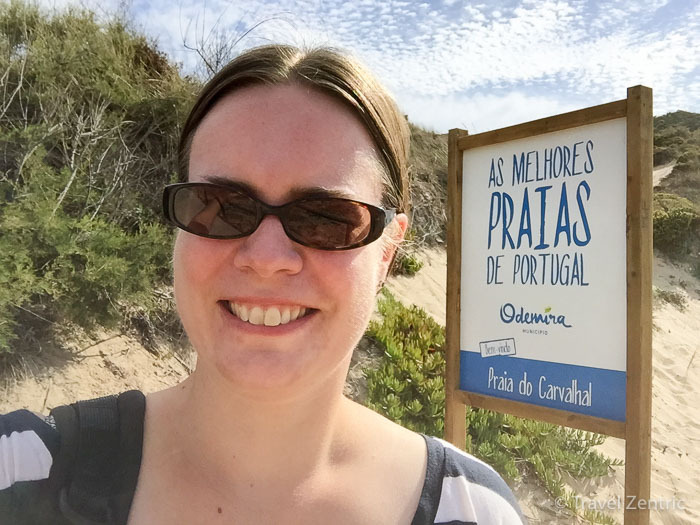 So I rented a car in Lisbon and decided to stay close to Zambujeira do Mar in order to discover different places from there. 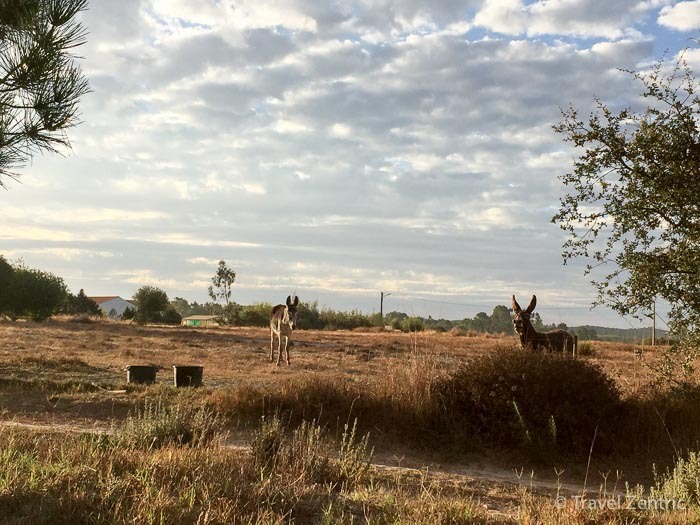 Find out more in this post about Alentejo, a rather unknown, but truly beautiful region along the south-west coast of Portugal. A sure tip for every individual traveler. 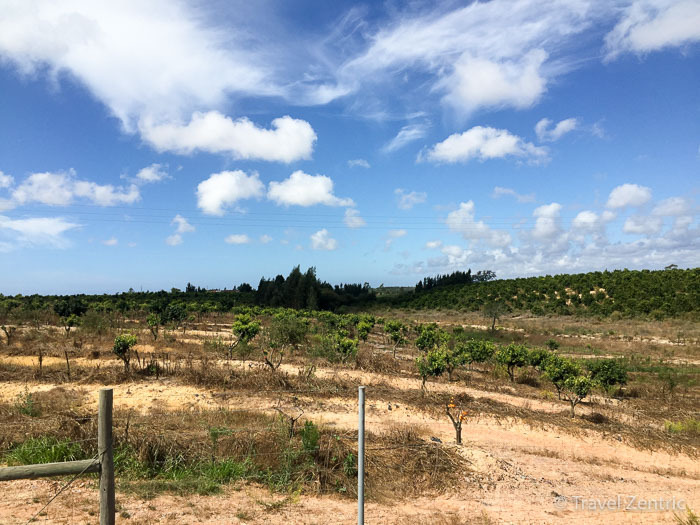 My route was a roundtrip from Lisbon to Zambujeira do Mar and back. But you might just as well go from Lisbon to Faro (or the other way round) if you have some more days to spare or if you don’t want to drive the same way back. I have been warned about the traffic in Lisbon, but with just one time taking the wrong exit, everything went smoothely. 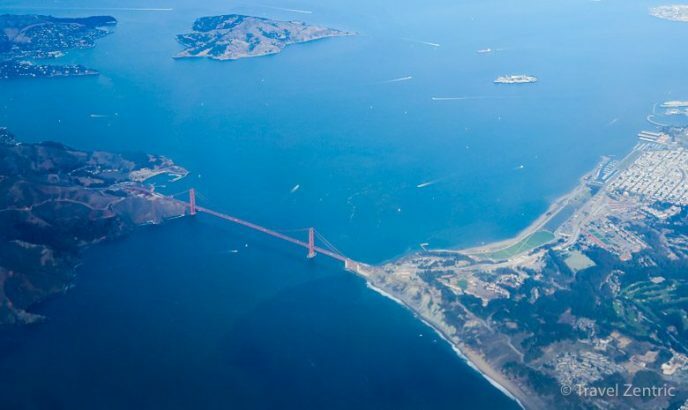 Do take the route via the bridge and enjoy the city from another perspective. I just love driving over suspension bridges. And this one is very impressive indead. 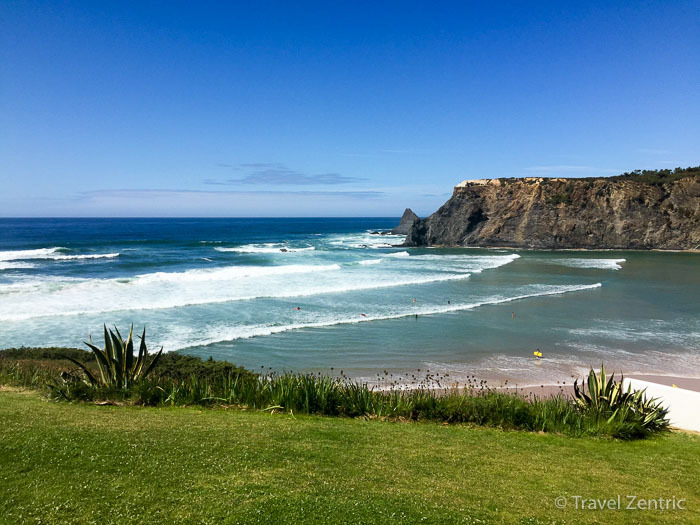 There are several opportunities to stop along the coast on the drive down to Zambujeira do Mar. 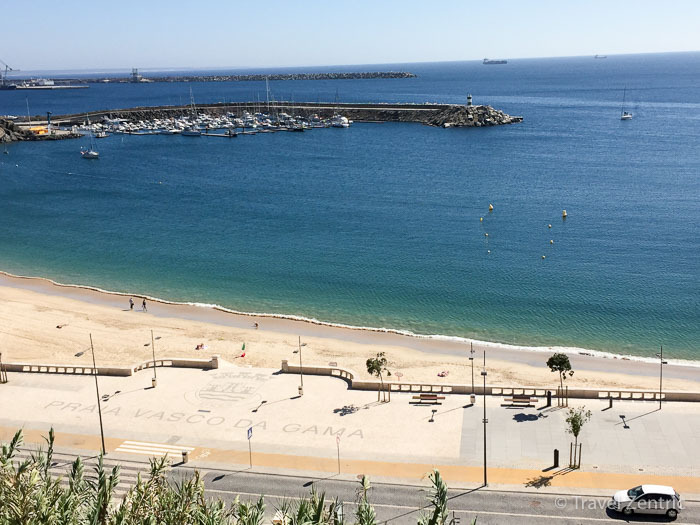 Sines has a large industrial area, but also a nice city centre and a city beach. 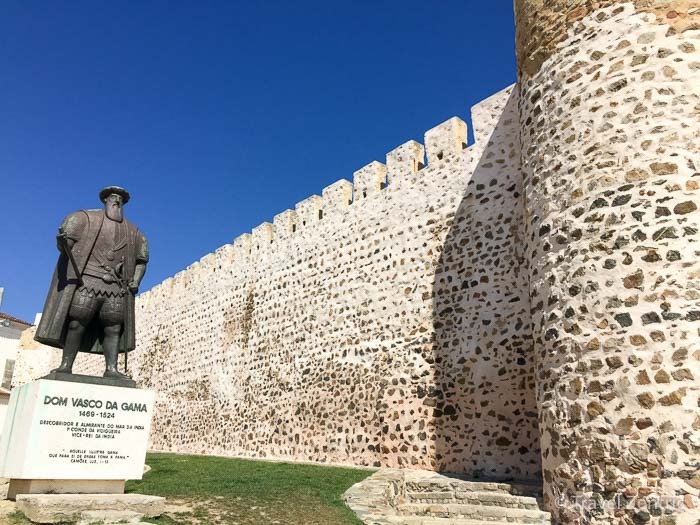 I found it perfect for a lunch stop, to have a look around the fort, the statue of Vasco da Gama (who is from Sines) and enjoy the great view on the harbour and the sea. 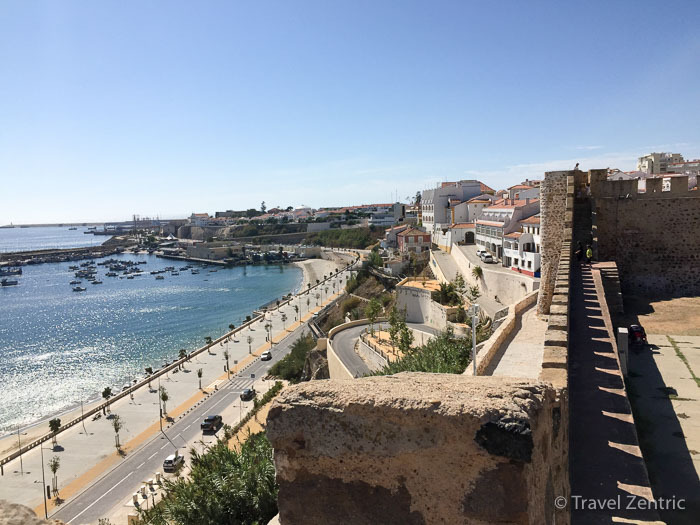 So Sines is well worth a stop or destination for a day tour. But what I saw from the quick glimpse I had, I would probably not pick it for a longer stay. 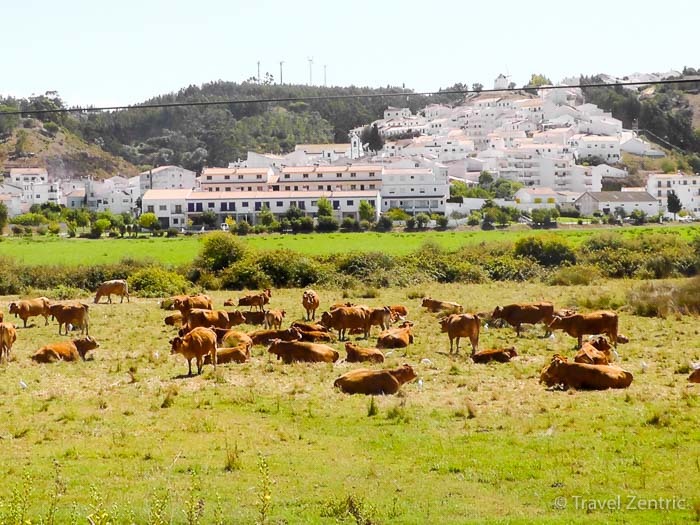 A 2.5 hours drive away from Lisbon, I stayed in a small village close to Zambujeira do Mar which is located in the middle of a National Park Parque Natural do Sudoeste Alentejano e Costa Vicentina. 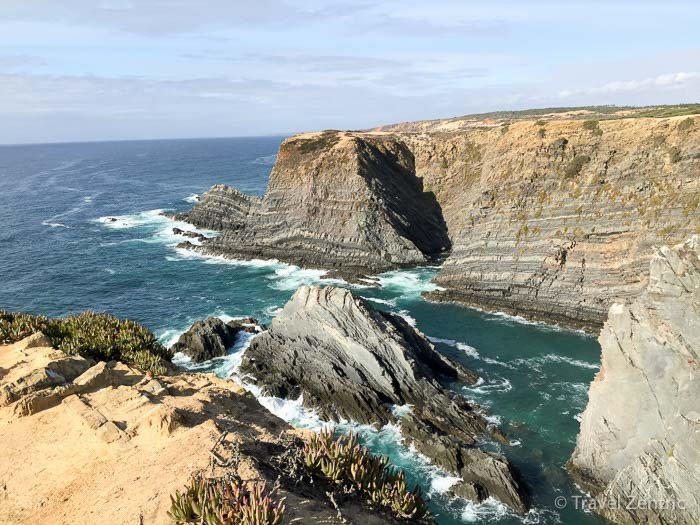 The name of the coast also gives name to the trail leading along the south-west coast of Portugal: Rota Vicentina. 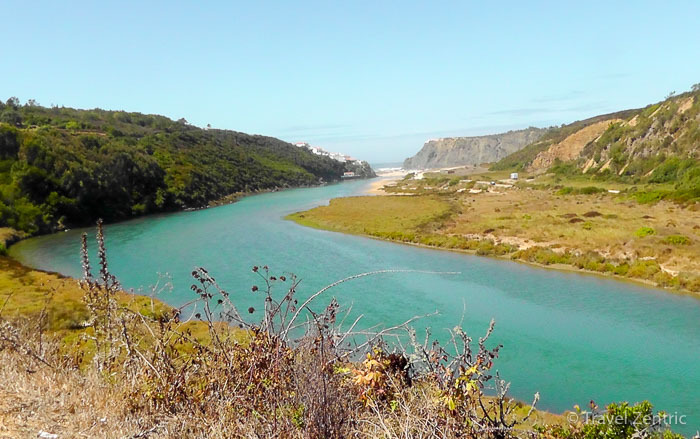 Definitely one item that landed on my bucket list: to hike a part of the Rota Vicentina or the Portuguese Camino de Santiago. Maybe even both. Back to my stay in Zambujeira. 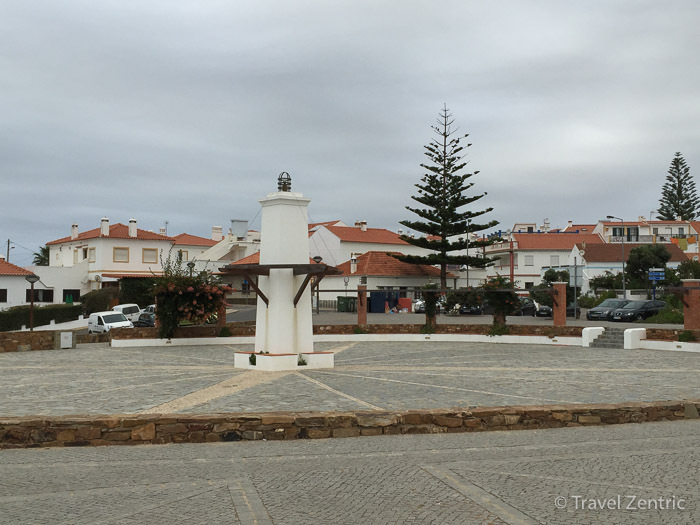 It is a neat little fishermen’s village with white houses and some cafés and restaurants in the city centre, a supermarket and a small tourist information. I had explicitly looked to stay at a place in a nature resort. So I had booked a room at this beautiful place which is totally remote. 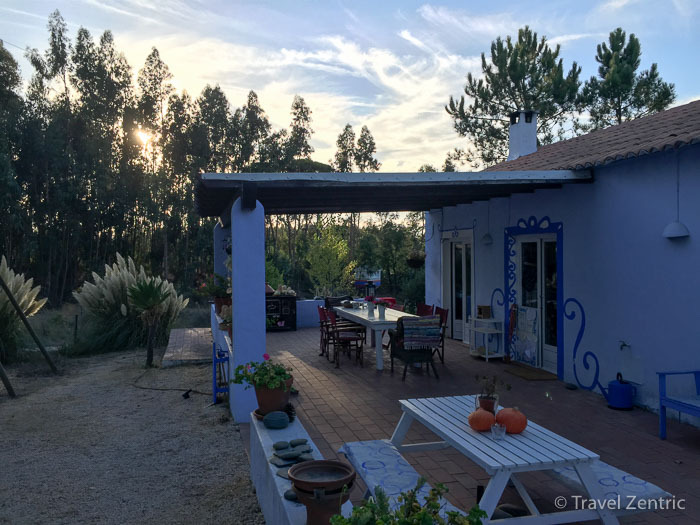 There were some other guests who also stayed via Airbnb, which made it great to exchange some tips about the hiking trails and beaches along the coast. But other than that it was quiet and just disturbed by the brays of the donkeys and the clucking of the chicken. Perfect! It was so relaxing that I spent some mornings there reading or writing instead of going to the beach. Lovely place to get some stuff done or just relax in a beautifiul environment. The afternoons I drove along the coast to several beaches that I will describe some more below. 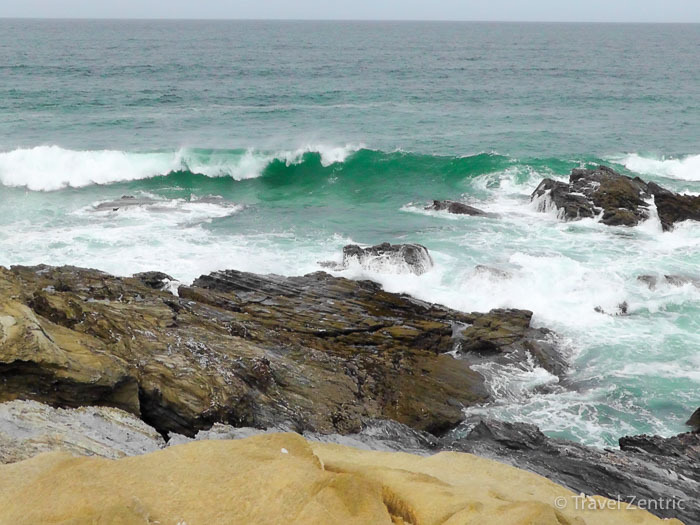 Cabo Sardao is just a ten minute drive from where I stayed (and very close to Zambujeira). It was recommended to me by several people. And since it was so close I definitely had to go. And it was definitely worth it. 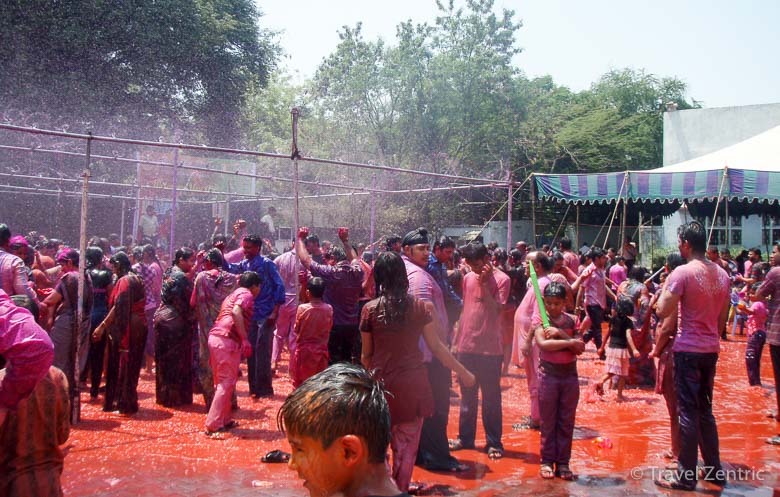 You cannot really miss it. There is a dusty road that leads to the lighthouse. 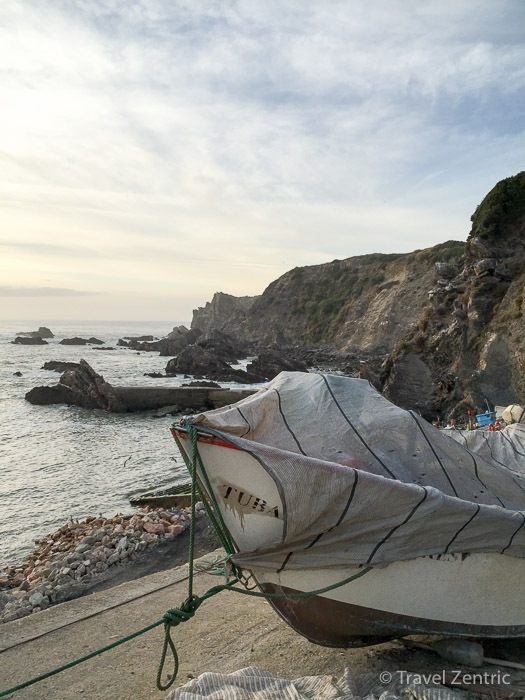 On its left side there is a parking lot where you can leave your car if you want to go on a walk along the Rota Vicentina. Take your time and take your camera. The scenery is really stunning. 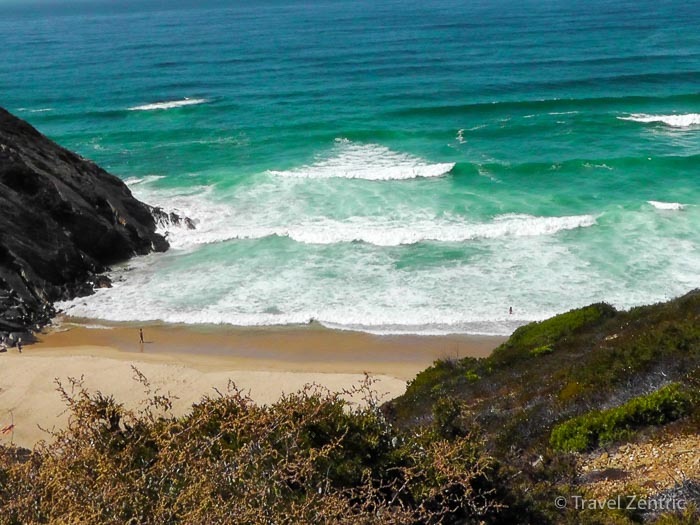 The beach of Carvalhal is like many of the other beaches in the Alentejo region framed by gigantic rock formations. The Praia do Carvalhal is a nice family beach. In September there were mostly locals and some tourists. Close to the parking lot shortly before entering the beach area, there is a small restaurant where I got some snacks for lunch. Everything is very convenient and completely without hazzle. Really, beach vacation like they should be! It was fun driving along the coast from beach to beach and enjoy the countryside and scenery on the way. 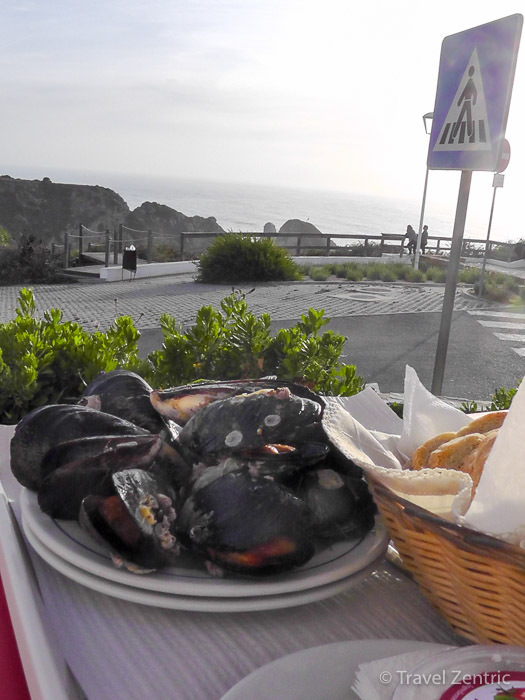 In the small village of Azenha do Mar there is a restaurant facing the sea with a great view (Restaurante Azenha do Mar). The restaurant was filled with locals and since I didn’t have a reservation, I did not get a table inside. But fortunately, they offer some meals to sit at the plastic tables outsides. I must say the better for me. 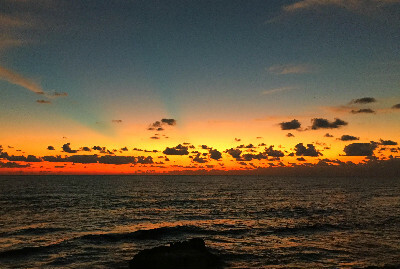 I enjoyed a good inexpensive seafood meal with a splendid view of the sunset. What more to wish for? If you want the whole experience with table cloth, a big selection of fish and a wine to go along, try to get a reservation beforehand. 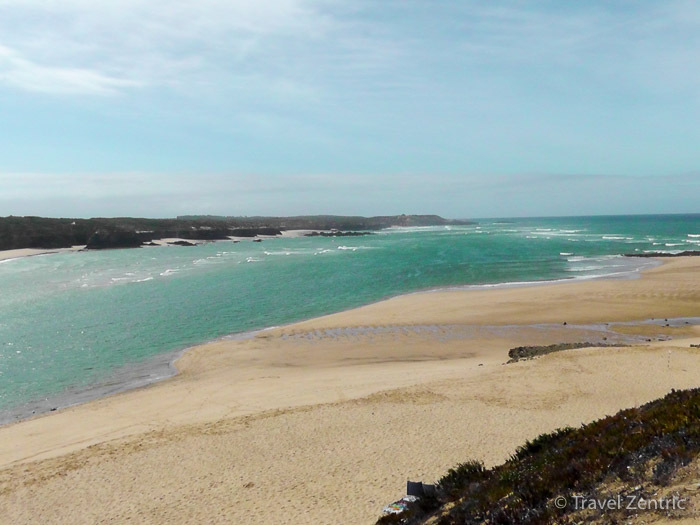 This splendid beach is located right at the border of the Alentejo and Algarve regions. Actually there are two parts of the beach. The northern part, reachable via a valley by car or by walking through the river from the main southern part of the beach. There is a circuit walk which is about 9km long. 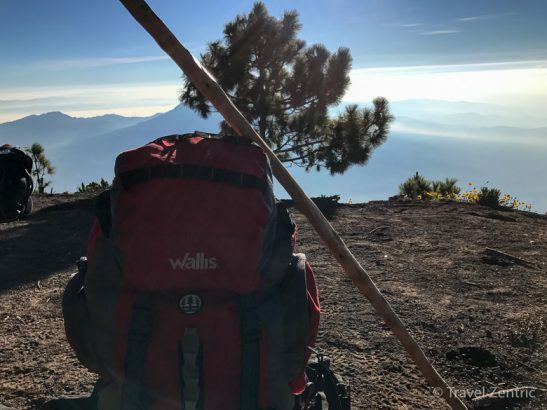 If you are looking for a hiking possibility, go for this. The valley is beautiful and well worth spending some time there, especially on the Northern shore. The southern part of the beach is accessible from the village of Odecéixe. 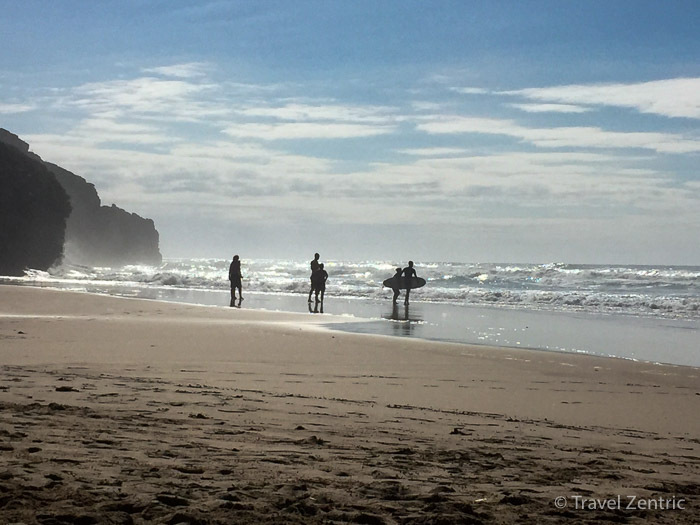 It’s a popular beach for surfers and it offers all the amenities (and therefore slightly higher prices) of a small beach town. I would have loved to stay longer. But on the next day it was time to return to Lisbon, of course not without stopping at some places along the coast. 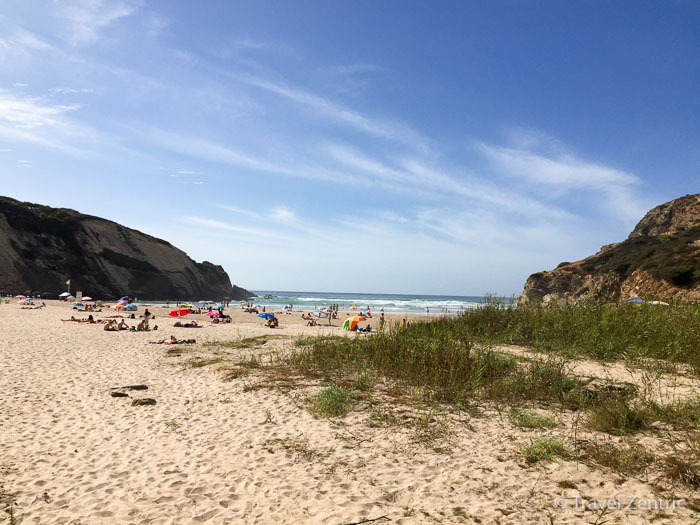 Also still belonging to Odecéixe is another beach Praia das Adegas, which is a nudist beach. You can reach it if you drive further up the hill from Odecéixe. There is a parking lot on top of the mountain. From there you can walk down and reach the secluded part of the beach. Vila Nova de Milfontes is like Odecéixe built along a river (Rio Mira). It is a neat little town with the right size and I immediately felt that I would like to spend some more time here some day. There is a castle Forte Sao Clemente which has been tranformed into a hotel nowadays, but which is worth seeing within the old city. You cannot really miss it anyway. 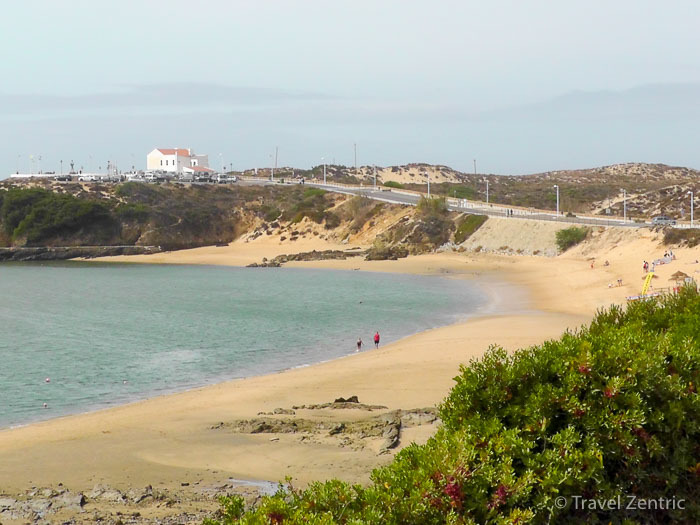 The Praia do Malhao is a bit away from town, but well reachable by car or bike. It is a rather remote beach and untouched without many facilities around. 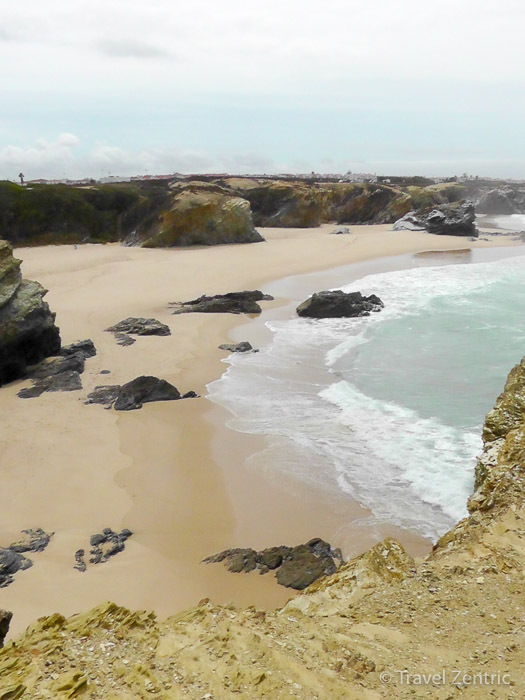 If you prefer a closer version, you should go to Praia do Farol. Here you also have a beach bar or restaurants nearby. 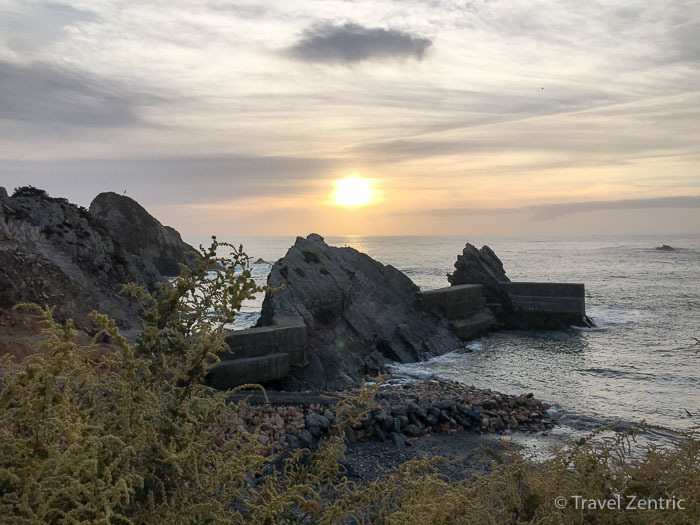 I did not really stop in Porto Covo, but a bit outside of the town and walked around to have once again a look at an astonishing coastline. 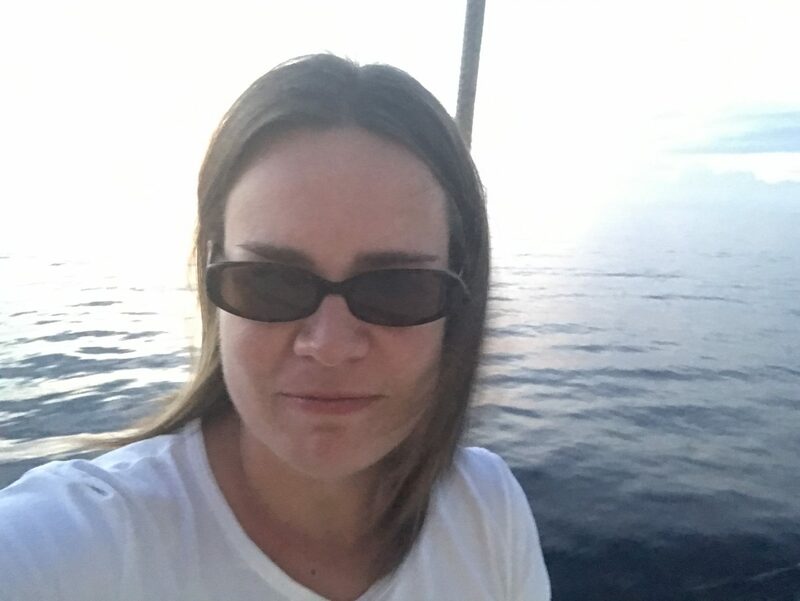 I can very well imagine spending time again somewhere between Porto Covo and Odecéixe. 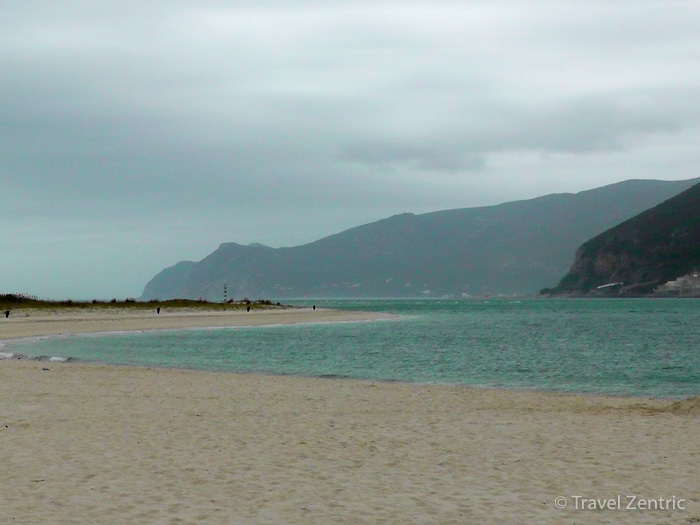 My final stop before returning to Lisbon was on the half island of Tróia. 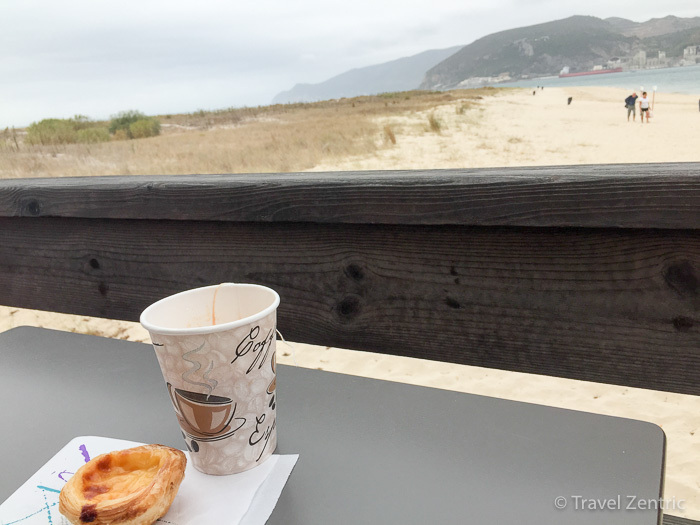 Unfortunately, I didn’t have time to walk in the nature park area of Troia and just stopped for a pastel de nata and a tea at the Tróian beach. My first impression was ambivalent. 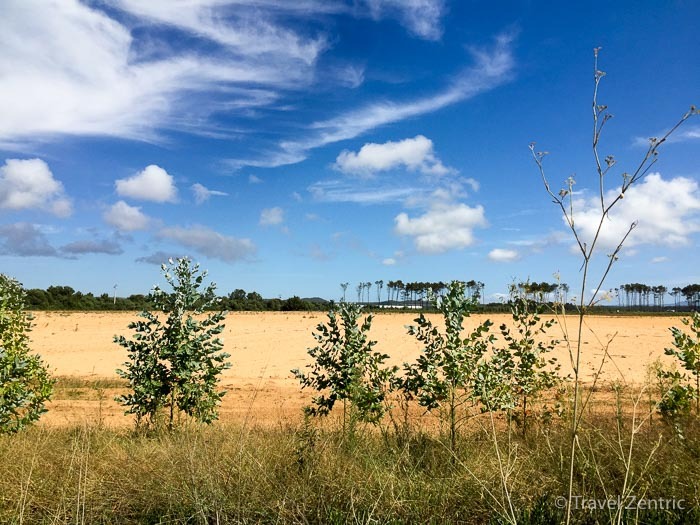 On the one hand the stretch of the nature reserve Reserva Natural do Estuário do Sado seemed to be great for excursions and a good stretch of nature to be explored. Also, the long sandy beach looked promising. What somehow appalled me was the area of Troia that looked rather artificial with big hotel complexes, a casino and the marina. I guess it’s the perfect destination if you want to have a high value accommodation combined with a gorgeous surrounding area and a good base for daytrips into nature or to the beach. Culture wise the Roman ruins Cetóbriga might be interesting. 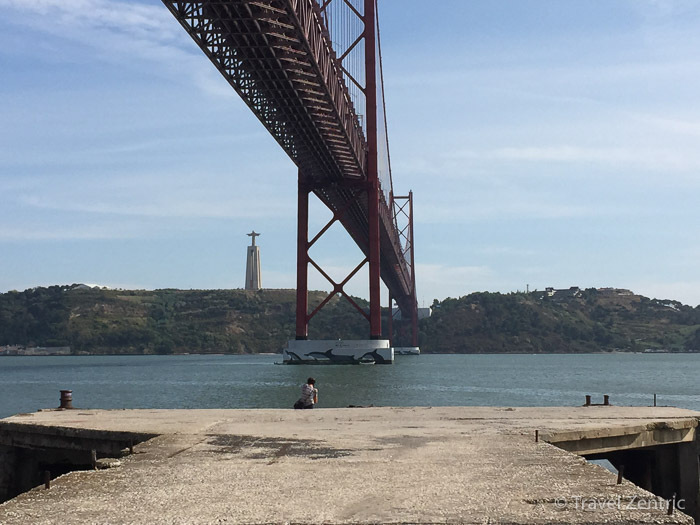 The ferry took me over to Sétubal, from where it was a short drive to Lisbon, one more time heading over the suspension bridge into the beautiful town of Lisboa. Europcar offers car pick-up and drop-off in the city center of Lisbon (at Hotel Tivoli). Some highways in Portugal require a toll. For this you can conveniently get a toll collect reader for automatic collection. The toll for the roundtrip between Lisbon and Zambujeira added up to approx. 14€. 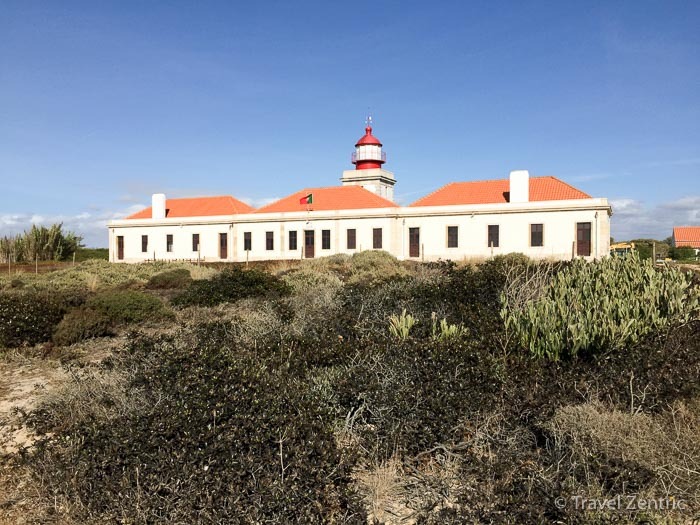 Other recommended daytrips from Zambujeira to the Algarve region are the Cabo de São Vicente (southwesternmost point of Portugal) and Sagres. Sagres is the town after which the most popular beer in Portugal was named. But you will be looking in vain for a Sagres brewery there. I hope this post has been helpful. If you liked it, please share it on facebook or twitter. And I would love to get feedback to the different places. 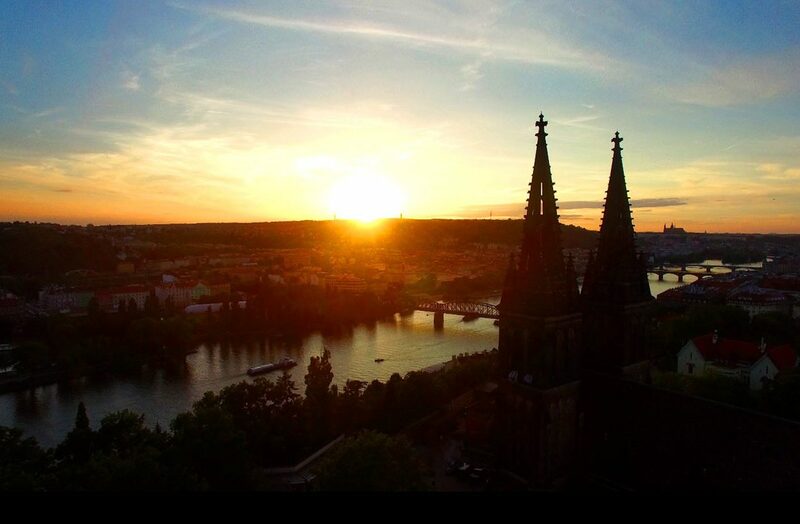 Did you have the same impression or did you find a new, interesting place in the region? Always love to hear from you.